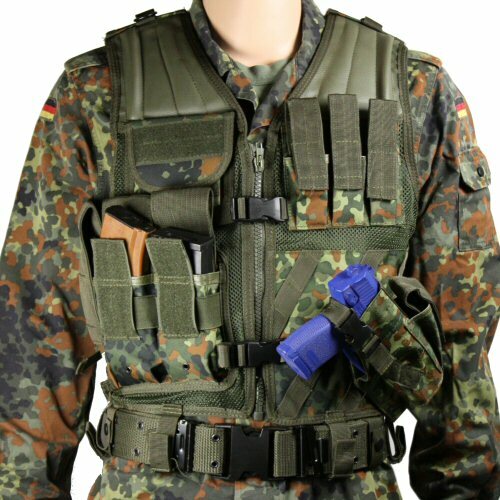 The Flecktarn tactical crossdraw vest is also known as the USMC vest and features a removable, angled holster on the left side for right hand draw. Made from 600D Oxford nylon, the vest features water resistant and dust resistant pockets on the body for storage of rifle magazines on the waist and pistol magazines on the chest. A utility pocket is located on the right chest, faced with velcro. The shoulders are padded and coated to cushion recoil and to prevent the gun slipping from the shoulder towards the arm. The nylon pocket lids for rifle and pistol magazines are detachable and adjustable for height with velcro. The rifle magazine pockets are also tied around with elastic to prevent the contents from slipping or riding with movement. 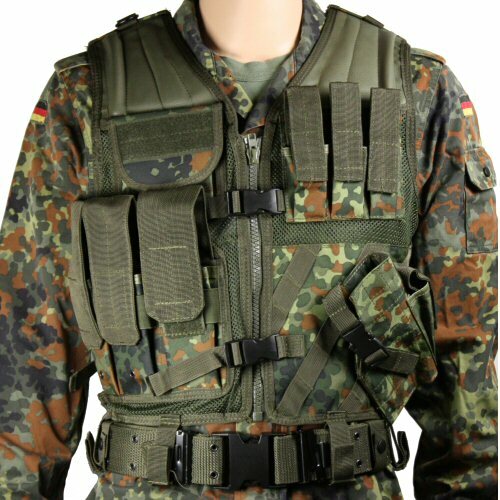 The left side holster is a MOLLE system holster which is mounted by means of web straps mounted at 45 degrees on the vest. The rear of the vest is made from two ply mesh, with one side opening to make a hydration bladder pocket. The vest is closed with a front chunky zipper, reinforced with two quick release buckles. The shoulders are adjusted for height with velcro and the sides are adjusted for length with three adjustable slides on each side. The vest has belt loops at the bottom for fastening around a belt. This helps to stabilise the bottom of the vest, while offering attachment for additional leg mounted pouches or holsters. 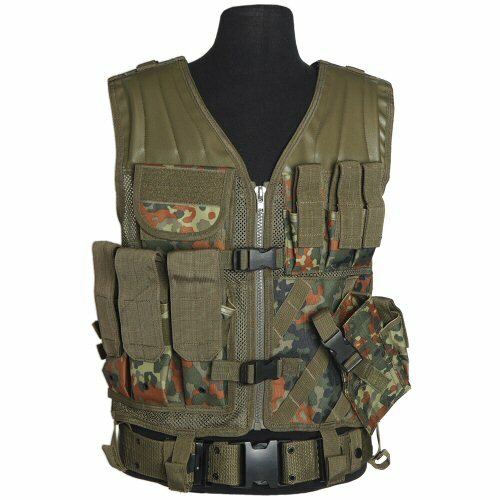 The vest includes an LC2 style 2in duty belt with a quick release buckle. A good starter vest at a reasonable price. Please note, accessories, including magazines, pistol, hydration bladder and clothing shown are for illustration purposes only, and are not included with the vest. The vest shown worn with a flecktarn field shirt and German army t-shirt. The vest shown with a G36 magazine, AK47 magazine and Mk23 Socom in the holster. Rear angled view of the vest, showing the velcro adjustment over the shoulder, the carry handle, a hydration bladder partially retracted above the carry handle. 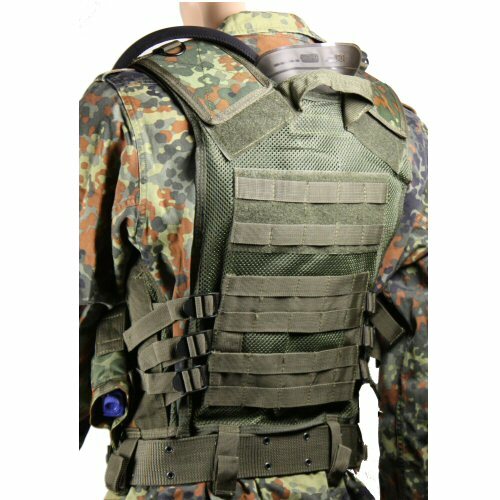 Also shown is the MOLLE webbing and velcro panel across the mesh back, three point torso adjustment on left and right and belt loops.